Wesley Lang heads up Caesar Guerini USA, perhaps the fastest growing line of quality O/U shotguns in the United States over the last several years. In a time where truly great looking guns are becoming rare, Caesar Guerini models uniformly finished to a very high standard. You can't buy a matte or ugly CG shotgun. Where some companies brag of their two, three or five year warranties, Caesar Guerini offers a lifetime warranty. Where factory service is either slow, costly, or non-existent, CG offers three free factory Pit Stops included with every new shotgun. With that, let's welcome along Wes Lang to find out more about where Guerini USA came from and where they are going. RW: Wes, some seem to have the idea that Caesar Guerini has only been around for a couple of years. How long has CG been in existence and where did it come from? Wes: I've been in the industry for many years, as you know. Out on the west coast in the publishing industry, I was too far away from what I knew I had a passion for. So, fortunately, my wife works for a nation-wide company, and had the opportunity to transfer back east. Giorgio and Antonio are a couple of extremely talented fellows on several levels, and they decided to strike out on the own from under the family umbrella of their uncle, Battista Rizzini. 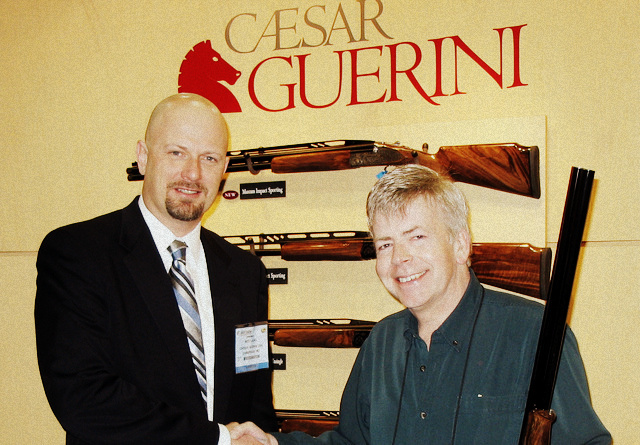 Caesar Guernini USA was formed in 2002 and by spring of 2003 we were delivering shotguns. RW: On January of 2011, the announcement was made that Caesar Guerini purchased an equity stake in Fabarm, creating the the second largest shotgun manufacturing group in Italy. It looks like this fellow Wesley Lang is President of Caesar Guerini USA and Fabarm USA. What is the history of Fabarm, and what does the combined company mean for future offerings from CG? My understanding is that Fabarm goes back some 112 years. Wes: Fabarm has a strong international presence and yes, has been around for over a century in one form or another. The combined company, from a Caesar Guerini standpoint, gives up greatly enhanced in-house machining capabilities, and shorter idea to market cycle as well. Though Fabarm has been successful internationally, the U.S. market presence has been erratic and small. With Fabarm USA, we can bring solid distribution and customer service to the Fabarm line in the United States, the level of which they've not had before. Above, Wes Lang, President of Caesar Guerini USA and Fabarm USA, discusses the measures taken to properly address an often overlooked but fast-growing segment of the shooting sports market: the female shooter. This is the thinking behind the new CG Syren line, designed to please women shooters. It is about time. RW: Shotgun fit is something almost universally agreed upon as being important, if not the most important single attribute a shotgun can have. Yet, it seems very few people in the United States have their shotguns professional fitted. Rumor has it, in Europe, the cost of fitting is often included in the price of a new shotgun. Does that sound about right? Since we are loathe to go through a proper fitting and we don't often consider custom stocks, models like the CG Impact series O/Us and the upcoming Fabarm XLR 5 Velocity seem to be the answer. In the case of a model like the Summit Impact (MSRP $5150 base price) you have the D.T.S. Rib (5% low to 90% high POI), a 7-way D.T.S adjustable comb, the D.T.S. Adjustable trigger, and you can balance things as you prefer with barrel weights and the kinetic balancer buttstock if you like. That's about as close to a truly custom gun as there is, as far as I'm concerned, without ever having to send the gun off or go the custom stock route. How has that been received for you? Wes: The Impact was our top-selling product for 2011. In fact, we have had them on perpetual backorder and haven't been able to keep any in stock until very recently. I suspect for field guns, yes, comparatively few folks have their guns fitted. However, with clays guns, it is a different story. The majority of clays and competition guns we get in for our Pit Stop program have has some stock work done, even if the work is relatively minor: the addition of a favorite recoil pad, for example. Randy: Many people have had love affairs with Italian shotguns. At the same time, poor or non-existent customer service, poor parts availability, etc., has killed the love for a lot of folks. CG seems to be the only brand of Italian gun where customer service is a reason to buy, not to avoid. I have a feeling that the focus on customer service didn't happen completely by accident? Wes: There are several events that had a very strong effect on me, personally, that have stuck with me for years. One was the story of L.L. Bean brush pants. I was getting set for a grouse hunt and I needed my brush pants. The inseam length was not as mentioned in the catalog, I received a phone call that the best they could do was a half inch shorter than I ordered. No biggie, they were just brush pants after all. The problem was, I needed them the very next day. I was told, no problem, even though it was late in the afternoon they would get them finished the next day. The very next day, I had them. I was bowled over and decided right then and there that L.L. Bean was getting my business permanently. Another example was returning / exchanging some Christmas gifts. It was a mad house, I dropped off my wife and we agreed that I'd circle the store until she could get it sorted. I was prepared to burn a tank of gas circling to pick her up. First go around the block, there she is . . . All done! They had forty or so tables set up for returns so it was instant in and instant out. It was events like these that affected me, showed me that great customer service while increasingly rare, really stands out. So, I decided that we would strive to make our customers feel important and appreciated, and go the extra mile just like L.L. Bean had done for me. It is all the difference between taking a chance by buying, and being able to buy with complete confidence.